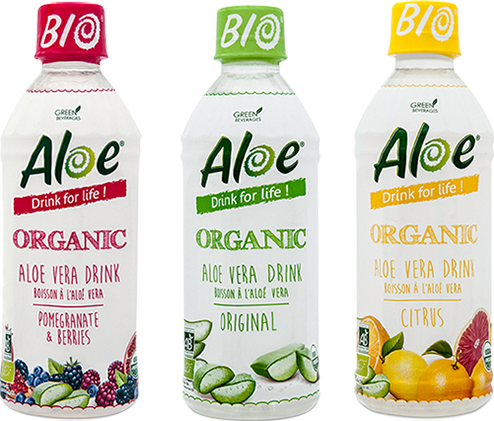 Aloe Drink For Life is a non-alcoholic flavoured water with pieces of fresh aloe vera pulp. Our organic and regular aloe vera drink is the best on the market, all natural, healthy and fun. Produced in Thailand from a very unique recipe (freshly pasteurized our aloe vera is the crunchiest on the market as its harvested and bottled within 48 hours), our aloe vera drink, Aloe Drink For Life, is the perfect combination of wellbeing and pleasure. Without colouring nor preservative, Without GMO nor Gluten, Vegan, Organic and regular our range of products is available in a large amount of natural and organic flavour in several formats.